It’s good to be back in the North Carolina Mountains. There is nothing like it. There are surely higher and more striking mountains elsewhere, but I will always have a soft spot in my heart for these, particularly the southern North Carolina Mountains, perhaps because I spent so many summers here as a child and young adult. I’ve decided I require dual citizenship, Alaska and North Carolina. It was just too hot coming across Missouri, Kentucky, and Tennessee, so I made a beeline, driving almost 800 miles in 2 days, for the elevation of the NC mountains, which took me from an average daily high of about 96 to a much more civilized high in the low to mid 70’s. 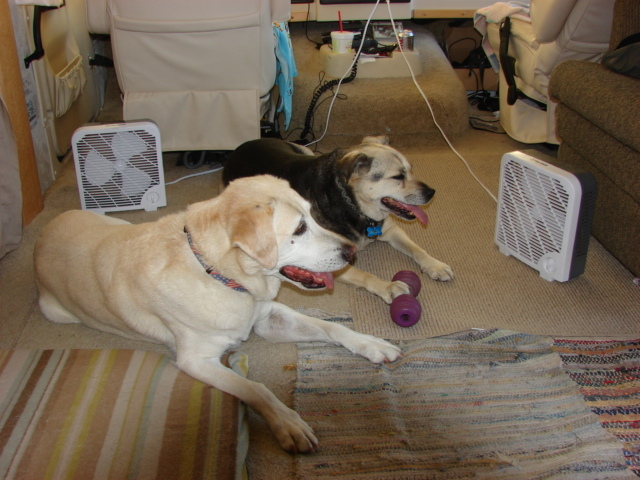 The dogs thanked me profusely as they were really having a rough go of it in the heat. Take a look at how they were spending their time prior to our arrival in the cool mountain air. With the handful of National Parks I’ve visited along the way, none had anything like the approach that the Great Smokey Mountain National Park has. Most of the NP’s I’m familiar with are, at least in part, surrounded by National Forest, State Park, BLM land or some other such natural border. This is most assuredly not the case with the Western Entrance to the Smokies. Ladies and Gentlemen, I give you, Pigeon Forge, the Las Vegas of the Appalachia and home to Dollywood. It all begins while you are still on the Interstate with billboard after billboard advertising the many Can’t Miss offerings of the area, much like South Of The Border, for those of you familiar with that except these Billboards are state of the art electronic signs designed to force your attention to them. After this bombardment, you exit into Sevierville, the birthplace of Dolly Parton, which is the warm up to Pigeon Forge located just a mile or two further down the road. Try to picture wall to wall over the top theme hotels and restaurants. One example is a restaurant called, Titanic, which is built as a replica of the ship and must be at least a quarter scale model of the original Titanic. It is ENORMOUS and comes complete with an actual bow wave since the bow portion of the building is sitting in a faux ocean filled with real water. Now please, who can tell me what on earth the Titanic has to do with the Southern Appalachia or Dolly Parton, or The Great Smokey Mountains? Anybody? Intermixed with these over the top hotels and restaurants were Biggie Sized Wacky Golf courses, Water Parks, Mini Amusement Parks, Ripley’s Believe It Or Not Museum, and Casinos boasting $2.99 steak dinners complete with “side” and salad, presumably to entice folks to come in to gamble. And let me not leave out the Hill-Billy Ho Down, the Country Jamboree, and the Gospel Singers of the Appalachia. I truly have never seen anything like it outside Las Vegas. And, of course, it was filled with people and bumper to bumper traffic. I wanted to stop to take pictures so I could prove the existence of such a place in eastern Tennessee, but was torn between finding a parking spot big enough and getting the hell out of Dodge. I opted for the later. After making it through Sevierville, Pigeon Forge, and Gatlinburg, TN, I was finally able to continue on into the Great Smokey Mountain National Park. Up over the top (highest elevation around 6,600 ft) and on into the NC side I went so to camp in a well shaded campground next to a clear running stream. Lovely. Yesterday, I decided to hike a small portion of the AT (Appalachian Trail). There is a geocache at the Ice Water Spring Shelter 3 miles down the trail from Newfound Gap, so that’s where I headed. For those of you who may not know, the AT is one of the longest footpaths in the World. It is 2,150 miles long and stretches from Georgia to Maine. 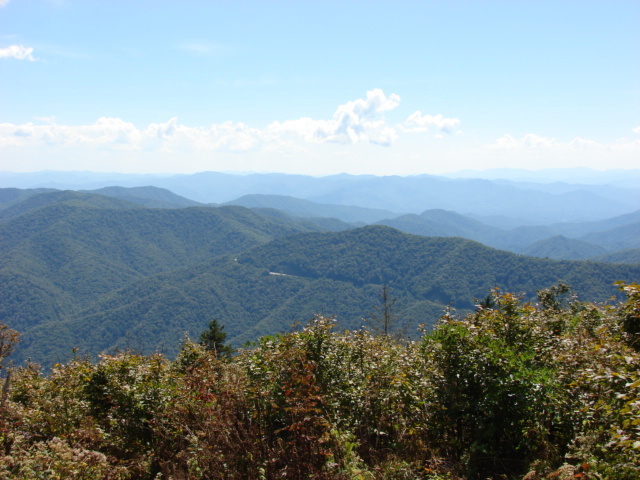 70 miles of it runs North/South along the ridgeline in the Smokey Mtn NP. 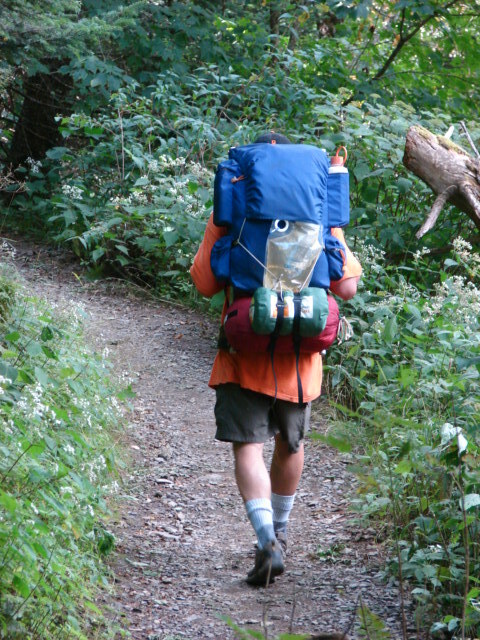 Many backpackers hike the entire length, from Georgia to Maine, in one season, May to September. These ambitious and hardy folk are called Thru-Hikers. Here are a shot of the Smokies looking East toward the Blue Ridge Mountains. 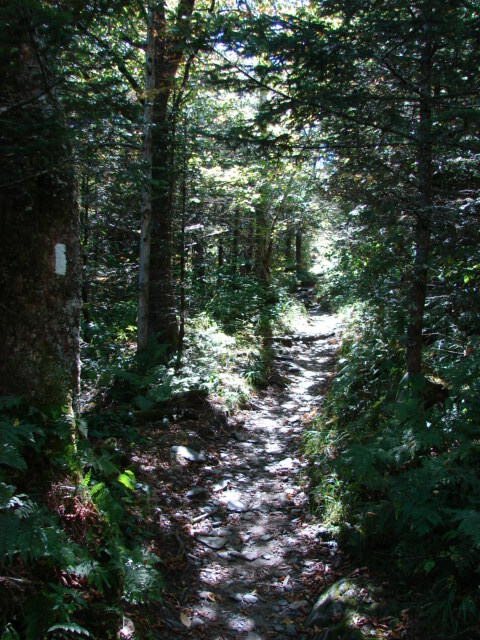 And here is the northbound entrance to the AT from Newfound Gap on the Tennessee/North Carolina border on the ridge line in the Park. And here, you can see the white rectangular blaze of the AT along with a view down the trail. 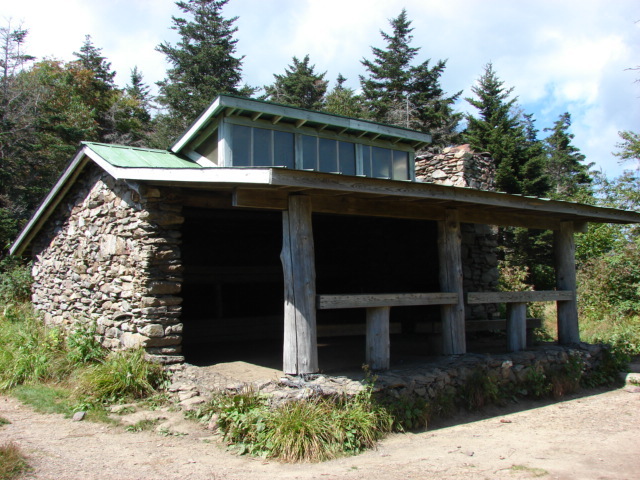 This is one of the many shelters along the AT. You can’t really see, but in the dark depths, there is a two layer, wooden sleeping platform running the width of the shelter along with a fireplace. 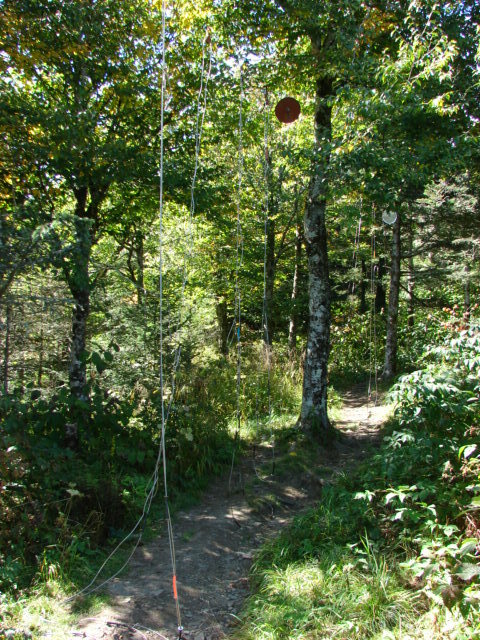 And, since Black Bears can be a nuisance, the trail maintenance volunteers have installed multiple Food Hanging Pulleys a short distance from the shelter. I’ve never seen this and wonder if all the shelters are similarly equipped. Heather, can you comment? In addition to the food hanging pulleys, this shelter also boasts a fresh water spring and privy. Southbound hiker. This guy jumped on the trail up in Damascus, Virginia and is almost finished since he’s getting off at Newfound Gap, here in the Park. That’s it for now. On Friday it’s off to Skyland Camp For Girls and some friends who have known me since I was knee high to a grasshopper. 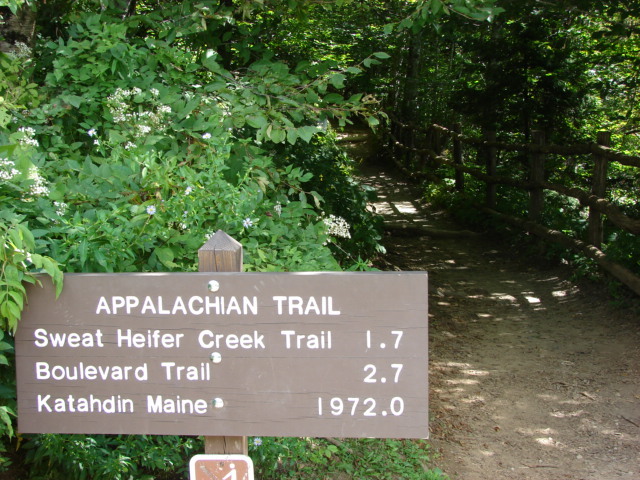 Do you see many single hikers on the AT…how long is the trail? Looking forward to your ‘coming home’. Hey! You got here faster than I thought! Welcome home!!! FYI – Chris takes a winter backpacking trip the first weekend of February. He wanted me to let you know that the last 2 trips he has slept in that very hut at least one night each trip! What a small world! Welcome home, nice pictures of the AT, I have been following a couple of thru hikers this year, one (galilee man) did it in about 65 days a speed run, the other is almost at the finish, she (HDMAMA) is about 120 miles from the finish and the older gentleman (mom)(73) is just now getting to New York, so he won’t finish this year. Based on what everyone has said in their logs all the shelters are pretty much set up with bear food pulleys and the fancy outhouses. HDMama even has a spot link so I can see where she is everyday and what progess she has made. Very high tech these day. Team Meister was supposed to be on the trail for 6 months but it became a groundhog day with the same thing everyday so he abanded his hike after just 2 weeks but did about 100 miles. Here is HDMAMA’s trail journal link. http://www.trailjournals.com/entry.cfm?id=328830 Hope to read more about the kneehigh to a grasshopper trip! Have fun and enjoy your cooler weather. Love these photos as brings back many many memories of week-ends in these mountains and short hikes on the AT. Also brings back memories of reading Peter Jenkins, “A Walk Across America”–didn’t he and his dog, Cooper, spend some time walking the AT. Your dogs are so adorable and seem behave. I am also into mountains and other serene place, I understand your appreciation for these places. Would appreciate more stories of your hiking soon!